Today's post is very exciting!! It's a collaboration with the gorgeous and very talented Nishi of NishiV! I discovered Nishi a while ago now, we stalked each others blog and then social medias - pretty sure we talk most days too. I need to meet this girl in real life!! She's a pro makeup artist, shopping enabler and amazing snapchatter. In today's post we shall be talking about our top 5 foundations for Asian skin tone, which range from being really dark to medium dark. The problem however, is that many brands don't produce foundations for 'darker' skin tones. Bourjois for example have shades that are far too light for me, which is such a shame because their foundations seem amazing. Nishi wrote this post a while back about the problems with drugstore foundations and it screamed out to me so much because its true. Finding a foundation that is perfect for olive, Indian, Asian, yellow toned skin is really hard. We decided to compile a list of our favourites to help those of you out there, who are in the same situation. 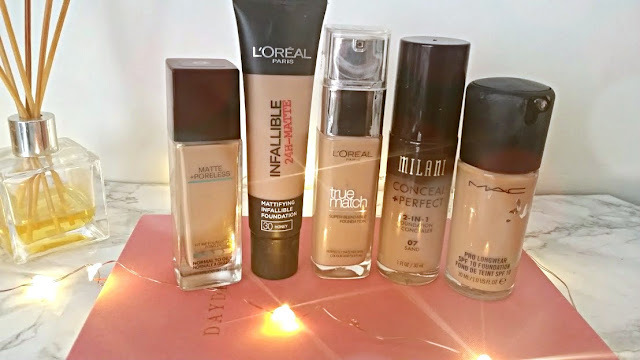 Even if you aren't, these are some great foundations to try out! 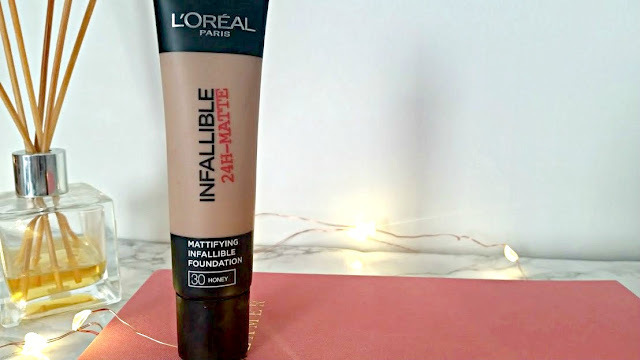 For my first foundation recommendation, I have a fairly new one that has been added into my collection and has fast become a everyday favourite. The Matte + Poreless from Maybelline has been out in the states for a while and slowly has made its way in the UK. The original shades in the range with the tube packaging are far too light for me, I did try with 230. Then when browsing the Superdrug websites I spotted darker shades and the US packaging. 322 is perfect for me and I couldn't be happier. If you have oily skin, then you must give this a go. Its very lightweight and medium coverage. It applies to the skin so well and after two layers your skin looks flawless, shine doesn't appear until at least 8 hours later and its great for everyday. My only hate is that it doesn't have a pump, if you aren't careful it goes everywhere. My relationship with this foundation is very odd, I love it when my skin is having a good skin day because the finish is so seamless. Within one layer of the foundation my skin is flawless looking and the mattifying properties is perfect for my skin. When my skin is dry or its hot outside my face dislikes this foundation a lot and it clings to patches as well as melts straight off - which is a such a shame. 30 Honey is a perfect shade for me in the winter when my skin is slightly lighter (is that even possible, but it is?!) but in the summer when I tan really easily the shade is slightly off and I wish they had a darker shade available. 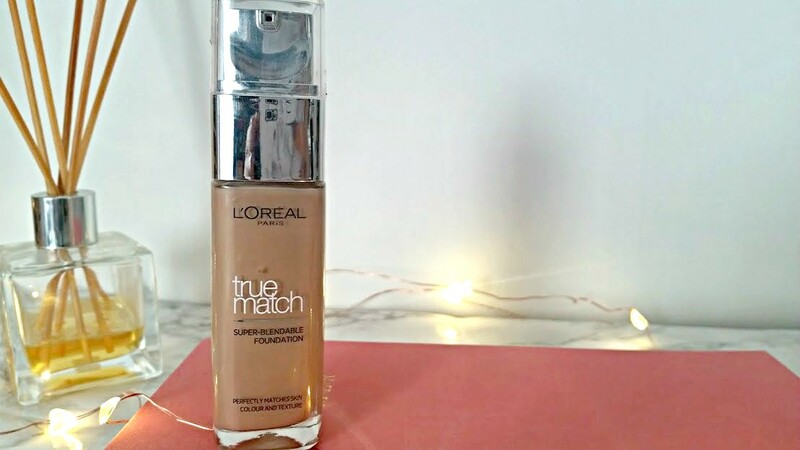 The true match foundation has been featured on here a far few times, because its one of my holy grail and probably always will be. L'Oréal seem to be the only drugstore brand I have tried that have a wide range of shades suitable for all skin tones. The true match range doesn't quite cater for my skin perfectly but it is near enough. The super blendable, medium coverage and lightweight foundation is perfect for the summer. It applies like a dream and sits well, even though it has a very dewy finish compared to the others mentioned in this post. I have been wearing this for work a lot these past two weeks because it doesn't budge primer or not.. It is a very liquid-y formula but the pump makes it a lot easier to work with, the real techniques buffing brush is my favourite way to apply this because it buffs into the skin like liquid gold. Another new addition to the foundation line up, but one I am really enjoying. 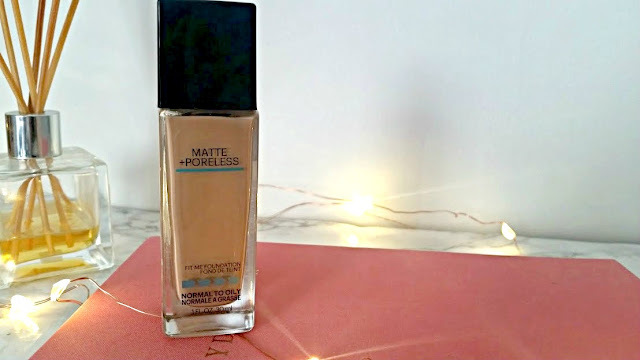 I did a first impressions on this foundation not too long ago, which you can find here. 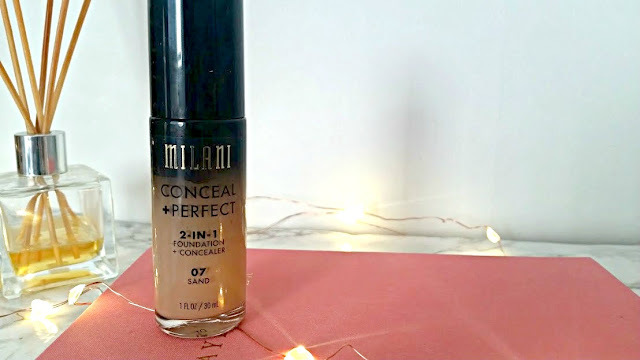 Its raved about in the US a great deal because of its high coverage ability, which it definitely is but the shades are so limited its hard to pick one that is perfect for your skin tone. 07 Sand, is an amazing match for my skin but slightly too dark which means it oxides throughout the day. The 2 in 1 means that foundation and concealer is both in one bottle, genius if you ask me! But the foundation is so heavy, you can feel each layer of it on your skin - which is why I have been keeping it for special occasions/evening wear only as I don't have to wear it for long. The pump is a lifesaver as it doesn't give out too much and you can control your usage, its one to get used to and if I ever head over seas I definitely would like to try out the other shades in person. 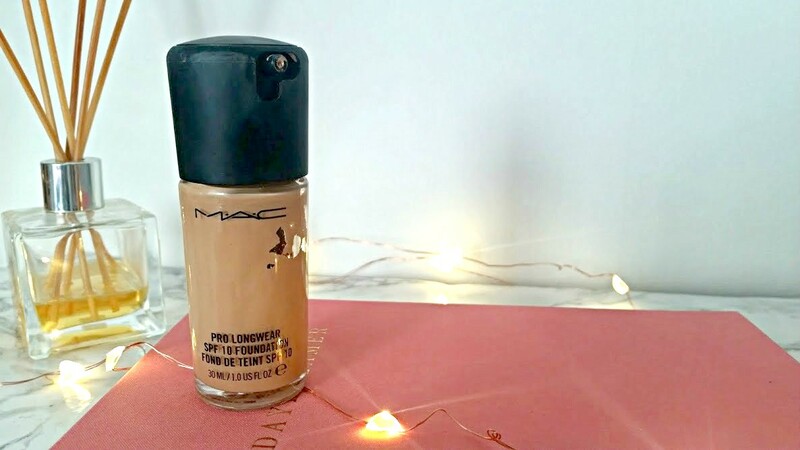 MAC have it sorted when it comes to foundation. They have so many different formulas, types and colours to suit everyone. I actually wish I had tried their foundations earlier than I did because then I wouldn't have had to battle all these years. Yes it is expensive to buy a new bottle, but wouldn't you rather invest in something that will last you longer and suit you better than something that is a waste of money? I have the Pro Longwear foundation which is a gorgeous high coverage, blendable, silky, matte finish foundation. It sits comfortably on my skin with or without a primer and lasts more than 8 hours each time I wear it. During placement this is all I wore and even now I use it whenever I know that my makeup needs to last me. 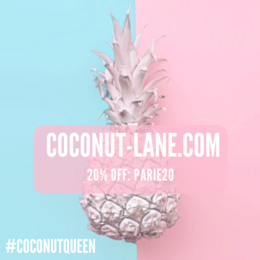 Its so long wearing and trustworthy that you are paying for amazing quality. As you can see I am nearing the end of the bottle and need to pop back into MAC to get a new one, whether it be this or one of their other ones I am not too sure.